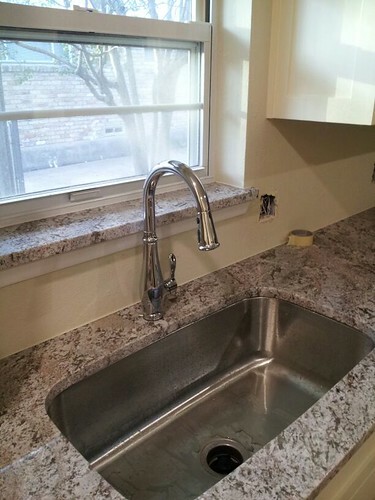 Plumbing Fixtures & Lots of Gray Paint! I’m back with a few more updates for you – the flip is looking awesome!! The stove makes me SO very happy. It’s 36 inches of loveliness. 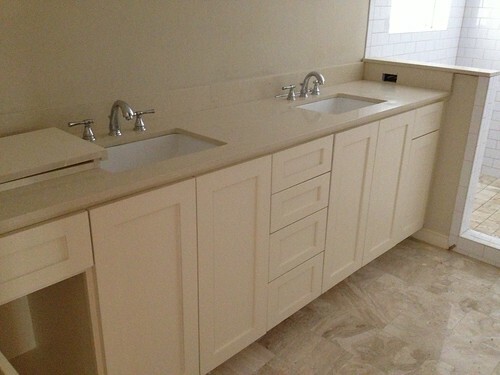 Below is the powder room . . .
. . . and the jack ‘n jill bath . . .
. . . and the master bath . . .
It’s starting to look like a real house, right?? I’m so happy with it so far! 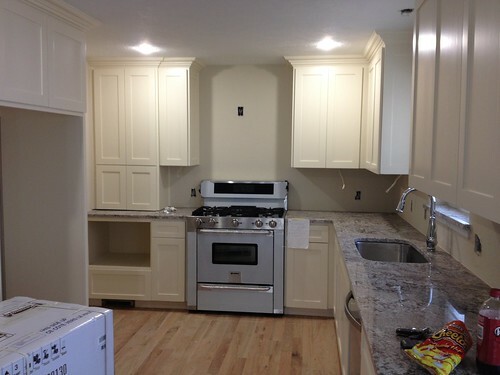 I hope to have better photos for you once the light fixtures go in. And last but not least, the brick has been painted! The painters still have to start the trim and add the black shutters, but so far I’m really really pleased with how it’s looking. I LOVE it! The tile in the powder room is just awesome. 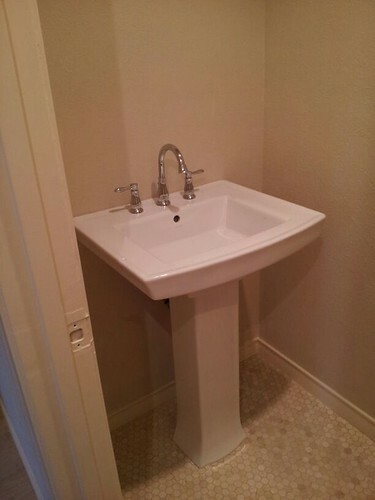 Are you putting handles/pulls in the master bath? Or leaving as is? So beautiful Liz! Did your painter paint the downspouts? Yes! Good eye. :) We asked them to paint the downspouts the same color as the brick so that they wouldn’t stand out. It’s looking so good. And I love the stove so much. I just pinned that shower for future reference :-) Its looking great! LOVE the grey paint!!! 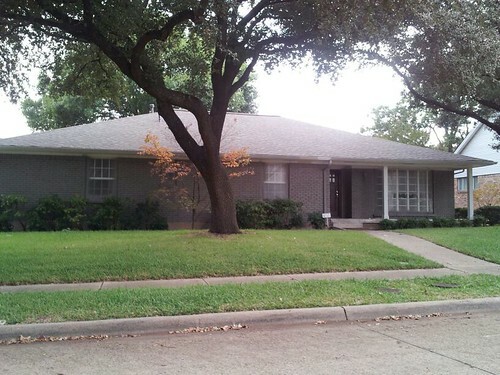 Not only does it look like a “real” house, but one I would really, really like to move into. 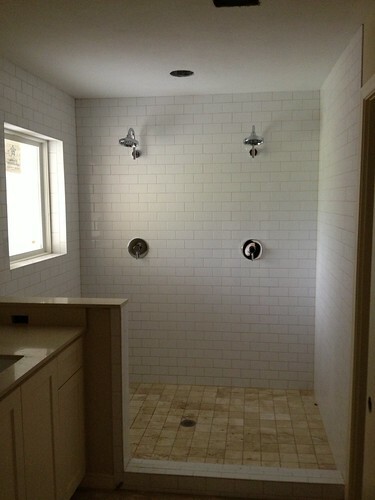 Can’t wait to see the glass in the master shower. 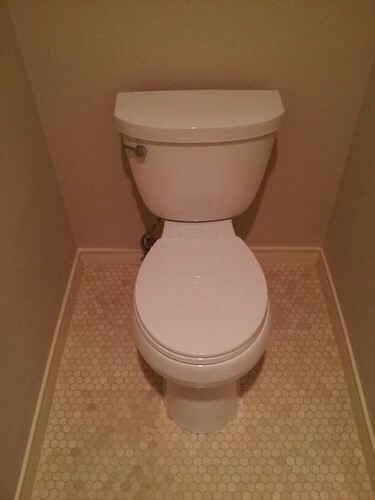 Really think the little hexagonal tiles in the powder room are terrific. Great job! 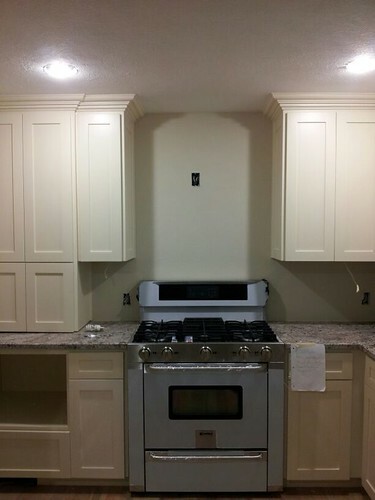 I really love that stove, it’s gorgeous. Gorgeous place! The shower looks heavenly. Holy smokes, that’s indeed a lovely stove. Looks like cooking will be so much fun! 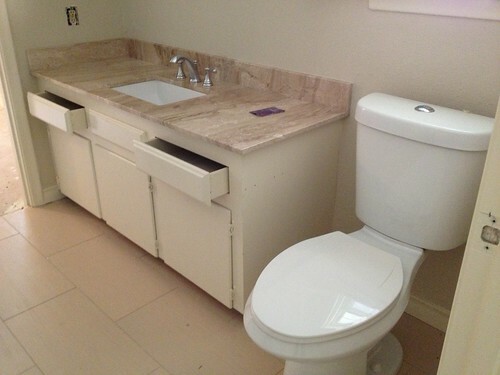 Love the spacious bath room, and the flooring as well. Great palette! I just love love love your style! Every flip I always think “wow I could move in there in a heartbeat”! Seriously. Anyone would be lucky to get one of your flips! I’m just going to pin every photo of yours into my ‘dream house’ board.